If you have felt nervous or anxious about visiting the dentist in the past, you’re not alone. At Shine Dentists, Franklin, we offer different sedation options so that you can feel relaxed at your appointments. Whether you fear pain, have had a negative dental experience in the past, have extremely sensitive teeth or are in need of complex dental care, our gentle staff will help you. Sedative medications assist you in feeling comfortable and sleepy, allowing your dental professional to begin the necessary procedures. The medications available range from anxiolytics to tranquilizers and have a number of ways they can be administered. Oral conscious sedation. You’ll take an oral sedative before you go to bed at night, then another in the morning, and be conscious throughout your procedure. You may not remember some of what was done and will feel drowsy. Please do not drive to or from your appointment because of drowsiness. Inhalation sedation. Commonly known as nitrous oxide or laughing gas, in just five minutes you’ll remember little of what is done and may fall asleep. It’s administered incrementally until the desired affect is achieved. Intravenous (IV) sedation. An injection will make you feel as if you’re sleeping, through you remain conscious and can follow your dentist’s instructions. The relaxation you’ll feel is so intense that you won’t remember much of what was done. The sedatives used in this form of sedation include Propofol and benzodiazepine. It’s not recommended for those who are pregnant, have glaucoma, lung or kidney issues or have an allergy to the drugs used or a fear of needles. It’s generally not recommended for older patients. Local anaesthetic. Nerve impulses to the site of the procedure are blocked with a gel or spray, numbing the area before the local anaesthetic is injected. You’re fully conscious but won’t feel the treatment. General anaesthetic. 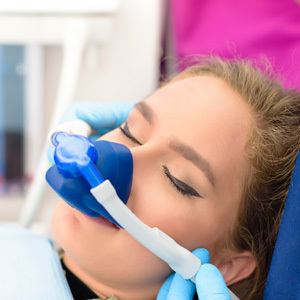 If sedation dentistry doesn’t work for you, this option will cause unconsciousness with side effects lasting for some time after the procedure has been completed. If you’d like to find out more about completing your dental care comfortably, contact us today! We offer same-day appointments.